Screen shot of the game Apophis from Pretty Good Solitaire. 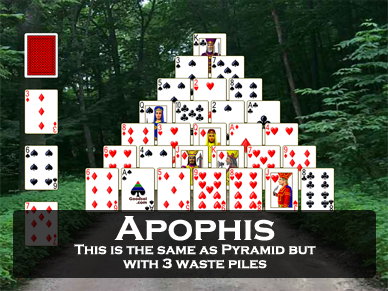 Apophis is a variation of the classic game Pyramid. At the start of the game, 28 cards are dealt out in a pyramid. 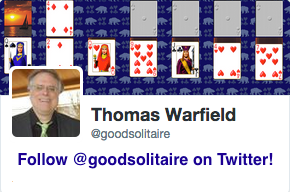 Three additional cards are dealt face up one each to three waste piles. The remaining cards form a stock. 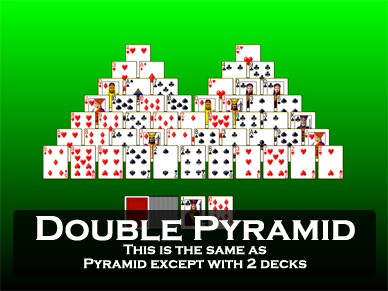 As in Pyramid, cards are removed in pairs with ranks that add to 13. For example, a Seven can be paired with a Six. Kings are discard singly. Only cards that are uncovered by other cards are available for pairing. Cards in the waste piles can be paired with cards in the pyramid, or with each other. When all possible pairs can be removed, clicking on the stock pile will deal one card each to the three waste piles. There are two redeals. Clicking on the empty stock will collect the cards from the waste piles and form a new stock. 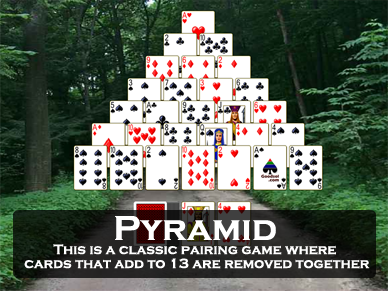 Strategy is similar to Pyramid, except there are more cards available for pairing. Remember that cards in the aste piles will become available two more times after redeals. 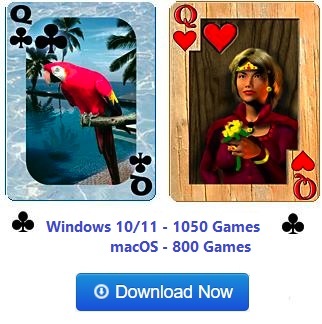 Apophis is one of the 850 games in Pretty Good Solitaire.